Product prices and availability are accurate as of 2019-04-15 11:18:36 BST and are subject to change. Any price and availability information displayed on http://www.amazon.co.uk/ at the time of purchase will apply to the purchase of this product. 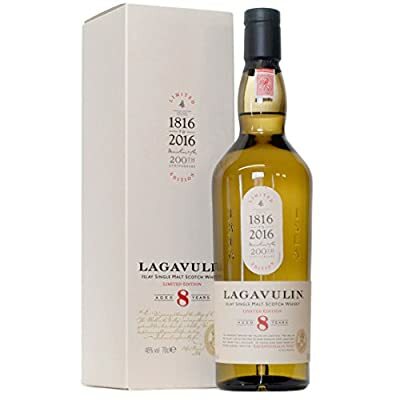 Bottled to celebrate the 200th Anniversary of Lagavulin, this 8-year-old was created in honour of famous whisky traveler and writer, Alfred Bernard. Whom tasted a malt of this age at the distillery during a visit in the 1880s. The whisky was matured in American and European oak casks before being bottled at 48% abv.